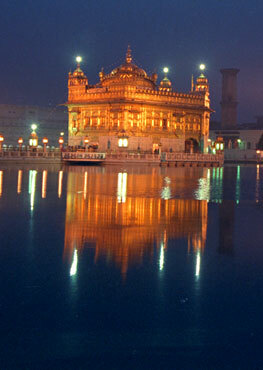 The Guru Granth Sahib is the channeled interfaith scripture cherished by Sikhs. The poetry of the Guru Granth is in itself a subject worthy of the highest consideration. The language principally employed is the language of the saints evolved during the medieval period-a language which, allowing for variations, still enjoyed wide currency in Northern India. Its appeal lay in its directness, energy and resilience. Based upon some of the local dialects, it was leavened with expressions from Sanskrit, Prakrit, Persian and Arabic. Another outstanding feature of the Guru Granth Sahib is the precision of its prosody. While a great deal of it, cast in traditional verse forms (salokas and pauris), could best be understood in the context of the well-known classical ragas, its hymns and songs make use of popular folk meters such as alahanis, ghoris, chands etc. The integral relationship between music and verse has been maintained with scholarly rectitude and concern. This complete musicalisation of thought in a scientific and studied manner makes for the unusually rigorous, yet supple, discipline of the Granthâ€™s metrics and notations. The entire Bani whose printed version in its current format comes to 1430 pages is divided into 33 sections. While the first section comprises the soulful and inspiring song of the Japji composed by Guru Nanak as also a few selected pauris or couplets, the final section is collection of assorted verses including the shalokas and the swayyas of the bhattas. The remaining 31 sections are named after the well-known classical ragas such as sri, magh, gauri, gujri, devghandhari, dhanassari, bilawal, kedara, malhar, kalyan etc. The division, thus, is strictly based on Indian musicology. Furthermore, each psalm or song is preceded by a number (mohalla) which denotes the name of the composer-Guru from Guru Nanak onwards. It may be noted that the apostolic succession extends from the First to the Tenth Guru, and that the Gurus are often referred to reverentially by their place in the order. What is more, each Guru speaks in the name of the Founder Guru whose spirit permeates his successors. The House of Nanak is indeed a spiritual decagon based upon a complete, inviolate geometry of vision. The major hymns-Japji (Guru Nanak), Anand (Guru Amar Das), Sukhmani (Guru Arjan Dev), Rehras (Guru Nanak, Guru Ram Das, Guru Arjan Dev) are widely recited solo and in congregation by the faithful as morning and evening prayers. Their soothing and ambrosial airs have brought solace and cheer to countless people all over the world. The Sikh philosophy as embodied in the Guru Granth Sahib is chiefly a philosophy of action, deed and consequence. Though in its essentials, it is completely in tune with the ancient Indian thought regarding the genesis of the world and the ultimate nature of reality, it moves away from queitism, passivity and abstractions. The emphasis is on shared communal experience, and on purposive and idealistic involvement. The extinction of the ego or self is the corner-stone of Sikhism. A person, we learn, finds fulfillment only by immersion in the sea of life. Thus, the path of renunciation, abdication, aloofness, flagellation etc., so typical of Hindu thought, is abjured. It's enjoined on a Sikh to be an insider, viewing with disturst all forms of alienation. Of course, the ideal Sikh is supposed to cultivate the qualities of contemplation, stillness and inwardness in the midst of labor business and engagement. He too regards the world as ultimately Maya or illusion, and the life of man as a tableau of light and shade, but the Nirvana may not be achieved except through an acceptance of the reality of this unreality, and a proper disposition of the allotted role in the phantasmagoria of life. To that extent, the relative concreteness or solidity of the world is to be endorsed as a measure of understanding. So long as man has a role to play, the artifact of the stage or the theater has to be taken for granted. For, it has thus pleased the Creator to bring about the world and people it with multiples of His self. And the whole creation moves according to a predestined plan. Many a time has the grand show on earth been mounted and dismantled. It is not given to creature man to fully comprehend the essence of reality. As for the concept of the Godhead in the Guru Granth Sahib, it sets upon the trinity of sat chit and anand. God is omnipotent and omniscient. He is the Initiator and the End. He is Self-Creator and Self-Propeller. The soul too in its essence symbolizes this trinity or the God within, though quite often it loses the state of bliss as a result of the ego and the Id. Caught in the meshes of power and pelf, it loses its true moorings, and is tossed about by the whirligig of time. A soul thus abandoned by the Lord, or alienated from Him, keeps spinning through aeons and aeons of suffering. The road to heaven is paved with pity and piety. 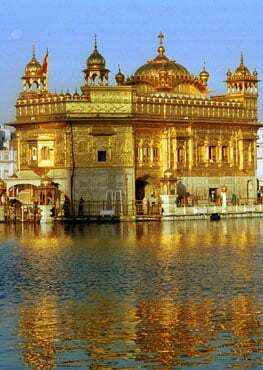 The idea of the soul as the Lord's consort is repeated in the Guru Granth Sahib with amazing variations. The mystique of the marriage is invoked time and again to emphasize the indissoluble and ineluctable nature of the union. Man is ordained wife, and commanded to live in the Will of the Lord. Any infidelity or transgression is inconveivable. The nuptial and spousal imagery of the hymns is sensuously rich, apposite and striking. It will thus be seen that the Guru Granth Sahib presents a comprehensive Weltans-Chauung or world-view. It offers a perfect set of values and a practical code of conduct. It is, indeed, the complete teacher.